Last week I wrote about meeting Chef Monica Pope. It was fabulous. You know what else was fabulous? HER RAW KALE SALAD. We’ve been eating a lot of kale with the boxes from Rawfully Organic. I’ve put it in sautés, salads, and made kale chips. Love it. Lincoln loves it. Sawyer is…well…uh. Anyway. Sawyer likes other things. So does Rob. 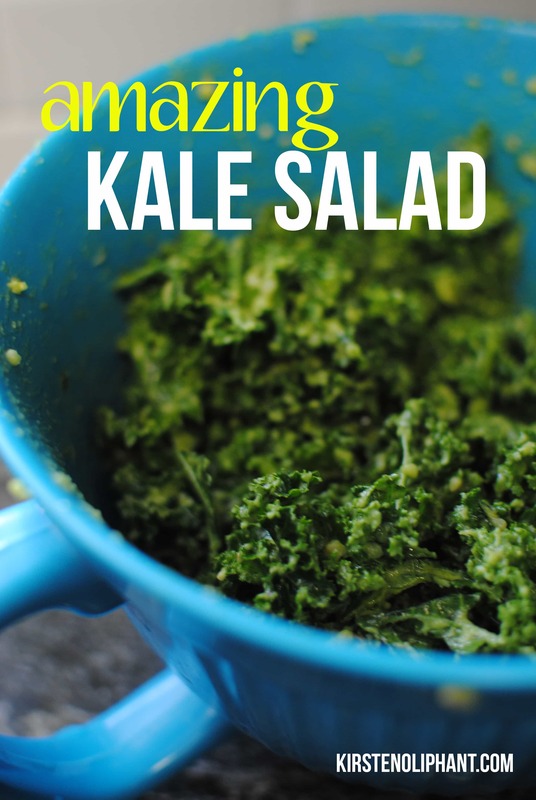 This is a really simple recipe with raw kale and what is almost a fresh guacamole. One of the keys is massaging everything together. Something happens to the kale. The fibrous consistency breaks down a little bit with the acid of the lemon and with the massaging. It gets softer, less bitter. I dare you not to like this. In fact, I dare you not to eat it with your bare hands like I did. I’m not sure kale is usually something people get all mouth-watery over, but I’m linking up with Rachel Matthews at A Southern Fairytale for Mouthwatering Mondays. I got to meet her at Blog Elevated and she can rock a pair of cowboy boots, I’ll tell you what! Smash the avocados and mix with the lemon juice, olive oil, and garlic. Mix this with the kale and massage it into the leaves. Let sit for a few minutes before serving so the avocado mixture will help break down the fibrous-ness of the kale and make it softer. I fell in love with a Kale salad this past weekend in Utah, and I love this with the lemon and the avocado!!! YUM! Adore you, chickie! Thanks for linking up! Thanks!! It’s seriously fabulous. I’ll be linking up even more. I am in a baking/cooking wonderland right now in my life, so yeah.